At a meeting just a few weeks after the first RRN supported families had arrived we stressed that involvement with the Charity would be a marathon and not a sprint. We knew that the desire to help would need to continue long after the news agenda had moved on to other issues. Given this it was especially wonderful to see so many long term RRN volunteers at last week’s Open Meeting. It constantly remotivates us and we feel incredibly lucky to work with such brilliant and dedicated people. Over 40 people attended and listened to the inspiring speakers Nadia had organised; Children on the Edge talked about their current work in Lebanon which we will be helping to support in the future and the Language and Industrial Skills Training Programme (LIST) spoke about the work they’re doing to help prepare several groups of adults back into work. We are preparing to welcome three new families into the area in the next few months. The last families arriving under the SVPRS scheme must be matched with a property by December 2019. As this deadline is fast approaching we would like to ask all RRN volunteers and supporters to continue the great work you’ve been doing in helping us to find private landlords. Each house found helps save the lives of a vulnerable family. October is RRN’s Serve food for Syria month please see below for details of upcoming events (including one this evening at the Madhuban in Liss) and details on how you can get involved in your own home. We are actively seeking new volunteers for some specific and much needed roles, please do share these roles with anyone who might be interested. As Summer draws to a close, it’s the time where we are usually at our busiest on the Resettlement Team. This year is no exception! We are in the wonderful position of having three new homes come up within just a few weeks of each other. As it happens, the homes are all in different towns in the local area. This actually works very well, especially as we have been approached by new volunteers who just happen to be from each of the towns. We will very shortly be putting lists together for furniture, please keep an eye on our Facebook page. If you have any questions or simply want to talk through what’s involved, please contact resettlement@ruralrefugeenetwork.org for more information. We are really excited that October is our month for Serve Food for Syria and we are delighted with the support and plans that many of our volunteers have in place. We are encouraging as many people as possible to host a meal (coffee morning, cream tea, dinner, fish & chip supper…anything you fancy) and ask friends to make a donation to the RRN and Children on the Edge. Please do remember to add your event to our new Facebook page, and like and share what you are doing, the greater the reach, the more money we should be able to raise. We are also thrilled by the support of the award winning curry restaurant, The Madhuban in Liss who are donating 10% of takings to our two charities from the evening on Wednesday 3rd October. So if you haven’t booked, there are still spaces. Enjoy a delicious curry and raise money at the same time. Call 01730 893363 or book through chefonline.co.uk. Likewise, Emily and Fred of Stansted Farm Shop are holding a fundraising supper onWednesday 11th October at 7.30pm. They’ll be serving a selection of mezze to start with followed by South Downs BBQ lamb with local vegetables and dessert or a vegetarian option. There are only 5 places still available whilst writing this, so please do book quickly if you would like to attend. Please remember to put the dates for the Alex Rennie London Art Show Tuesday 4th and Wednesday 5th December and the RRN annual Walk for Hope on Sunday February 3rd 2019 in your diaries. There are also a number of further events that are helping to raise money for RRN detailed below. Thank you as always for your amazing support. Marketing & Communications help needed! RRN needs volunteer ‘Apple cutters’ on a rota. 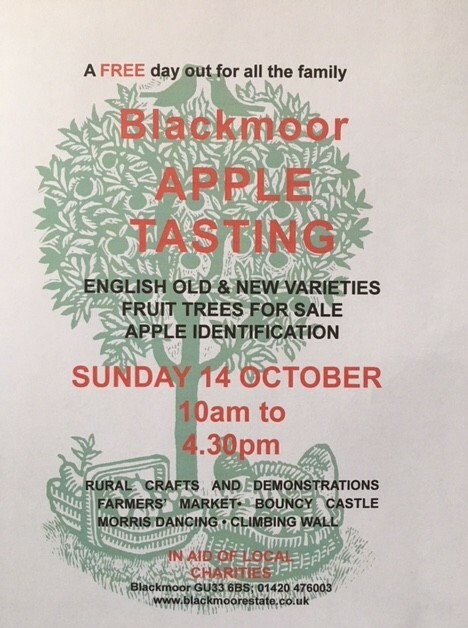 The event is on Sunday 14th October from 10.00am to 4.30pm. We also need volunteers to help with the RRN stall (can be on rota with Apple cutters) – setting up is at 8.30am. Details of the stall to be confirmed soon. RRN successfully delivered a second training on 7th September. Two community teams are now fully trained, in place and ready to help the imminent arrival of two new families in East Hampshire. Each team will be supported by a team leader and congratulations to Kay Summersfield and Vicky Baum who will be taking on these important new roles! The LIST programme has been up and running for four months so none of the learners are pre-entry any more. The group have also been doing practical skills together, which has given the tutors a sense of the way they work and learn. This, added to the initial skills and aspirations assessment will form a profile that the tutors will use to help them going forward. The next stage for the group is a programme which is more intensely focused on looking at helping people make the step into work. This includes looking in a very focused way at any specific barriers that still exist for them (for example, certificates they need, travel issues etc.) and working to overcome these, as well as working on CVs, applications and interview techniques. The LIST team have already found a Winchester employer who specialises in stone work who is happy to give two of the work ready members of the group experience, with a view to hiring in a part time role if everything works out. If you know of any businesses in the area which might support a work experience placement please do let us know. RRN has supplied a cooker for the commercial kitchen at LIST for those keen to get into cooking can take their Level 2 Food Hygiene Certificate. On the Tuesday 10th October LIST team are having an open day, so anyone who is interested in going along and attending this event, please email Clare at, masson.clare@gmail.com and she will send you the invite as we need to know numbers. By the time this report is published we should have acquired three more properties in Hampshire. It is always a slow process; some involve purchases and as anyone who has moved house knows, these rarely happen on time! We now have a housing checklist so that we can ensure that we collect all of the necessary information systematically and efficiently. To encourage more owners to come forward, it’s important to celebrate the positive impact refugees and immigrants generally continue to have on British life. The most recent news is that immigrants contribute £2300 more pa to the UK economy than those born herehttps://www.independent.co.uk/news/uk/politics/eu-workers-uk-tax-treasury-brexit-migrants-british-citizens-a8542506.html. 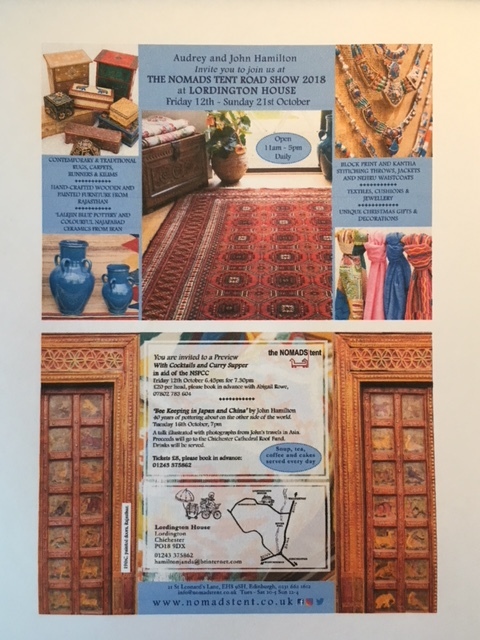 From Saturday 13th – Sunday 21st October (Preview on 12th, pm) Audrey and John Hamilton are hosting a selling exhibition of Tribal Rugs and Crafts which will come down from The Nomads Tent in Edinburgh. Refreshments are sold during the Exhibition in aid of RRN. See below flyer. The University of Winchester opened its doors to refugee families for a Family Fun day on 23 June during World Refugee Week. Following a successful event last year, the University of Winchester Widening Participation team coordinated the event with the Rural Refugee Network (RRN). The event was managed by a number of RRN, student and staff volunteers. Families from Chichester, Winchester and Southampton joined RRN families in our biggest group ever. The event was attended by a wide range of ages, from young children to the elderly. During the day, student and staff volunteers welcomed refugee families and ran a range of activities, including crafts and sports games. Guests were also treated to cakes and sandwiches, all of which were donated to the event. Huge efforts were made to ensure every guest felt welcome, with translation services available for those who spoke English as a second language and massages were offered by Kathryn Bingham (RRN), Carol Nettleton and Jemma Wheeler. LUSH donated bags of free products for each family. Thank you to all our volunteers who baked and contributed on the day to make this a lovely gathering.